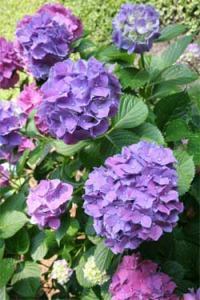 In 2004, a group of volunteer gardeners initiated construction of an extensive new hydrangea garden. Working with Augusta Public Services, Trees and Landscaping Department, a plan was created and the hydrangea garden began to take form. For three years, the volunteers raised funds, dug up hydrangeas donated by Augustans, solicited hydrangeas from local nurseries and learned all they could about raising hydrangeas. 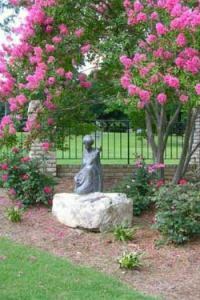 Additional volunteers continued to join the group, and the hydrangea garden was offered to the community with a hydrangea festival including speakers, exhibits, and tours. Since then, a more formal upper garden with several hardscape structures has been added. The pergola and swing structure were built by skilled volunteers, and hydrangea paniculatas and complimentary plantings were added. Over 250 hydrangeas of more than 70 varieties make up the garden which is at its splendor in June and July. The upper, more formal part of the garden contains a pergola which may be used for programs, concerts, and weddings. The lower garden displays macrophylla (mophead and lacecap) and oak leaf hydrangeas, while the upper garden contains paniculata (sun-loving) hydrangeas and comes into full bloom in July and August. The hard-working volunteers continue to maintain the garden.